In a bowl, whisk together the garbanzo bean flour, nutritional yeast, turmeric, garlic powder, white pepper, and salt. Set aside. Pour the aquafaba into another bowl and add in the cream of tartar. Beat with a hand mixer until soft peaks form. Add the dry ingredients into the whipped aquafaba and fold gently to combine. Fold in the herbs. Spray the pan with nonstick spray. Ladle in a scant cup of the omelets mixture. Use a nonstick spatula to spread out the batter. Cook until the top of the omelet forms bubbles and the bubbles around the edges just begin to pop. 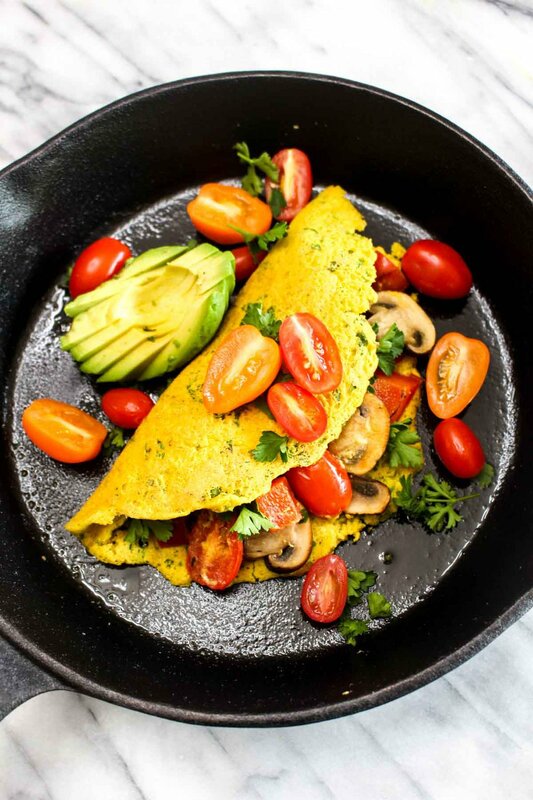 Add in your filling ingredients to one side of the omelets and fold it over. Cove and cook for 1-2 minutes until the inside is set and not raw. Serve.